The Reebok 8000C treadmill comes equipped with a pair of 2-lb hand weights and six cross-training workouts for upper body conditioning. The ClearView™ backlit display tracks speed, time, distance, pace, pulse, calories, and carbs burned. The 7x30 scrolling crosstrainer display shows workouts graphically and indicates when to pick up the hand weights. You can choose from 9 Weight Loss workouts that include calorie-targeted programs (200, 400, 500, & 600 calories), and more. The Reebok 8000C has a user weight input feature on the treadmill console for cal-burn calculations — but you can bet that it isn’t very accurate. Shame on Reebok for putting a “600 calorie burn” program on the console and trying to sell this to the public who might not realize that it takes 2 to 3 hours for an average adult to walk off that many calories. Calories, or energy used, is a calculation resulting from your weight times distance (not time). A 180-lb person burns around 100 calories walking one mile, or six miles to burn 600 calories. The motor on the Reebok 8000C treadmill is 2.8 hp, or about 1.35 continuous hp, which shouldn’t be counted on to handle too many 600-calorie workout sessions. As for the rest of the specs, trainers and equipment pros give this model props for a good-size walking area, a 10% incline, a workout fan, and a set of lightweight dumbbells. However, the components used in the low-end Reeboks are cheap, a fact that is reflected in the short 90-day parts warranty. There are reports of reliability issues with the Reebok 8000C that you should be aware of. There are reports that some Reebok machines don’t work even when they are brand new right out of the box. To make a bad situation worse, Reebok’s customer service is given poor marks in many treadmill reviews. While this good-looking hamstermill sells for around $799, there’s no way you should buy a cardio machine for that much with only a 90-day parts warranty. For $800 you can get a Horizon or a ProForm with at least a 2-year parts/labor warranty and equipped with a stronger motor. You want a treadmill for convenience and value, something that will last at least 5 or 6 years, and some affordable treadmills have been known to last as long as 10 years. 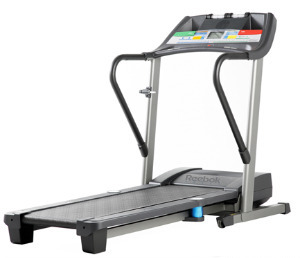 If you have a multi-user household and want a machine that will be used a couple of hours per day, the Reebok 8000C treadmill is not a good choice.